Tag line: "...a motion picture for all times!" England's King Henry VIII (Robert Shaw) has divorced his queen so that he may marry Anne Boleyn (Vanessa Redgrave), whom he hopes will bear him the son he so eagerly desires. Sir Thomas More (Paul Scofield) is the Country's Lord High Chancellor, and has always been the King's loyal subject. However, Sir Thomas is also a man of God, and when the divorce causes a rift between the Church of England and the Roman Papacy, he resigns his position. What's more, Sir Thomas refuses to swear an oath of loyalty to the new Church of the land, despite the best efforts of the King’s ministers, Thomas Cromwell (Leo McKern) and The Duke of Norfolk (Nigel Davenport), to convince him otherwise. A man of principle, Sir Thomas is unwilling to yield, and may just be forced to carry his moral stance with him to the grave. 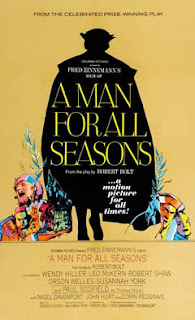 Based on Robert Bolt's award-winning play, A Man For All Seasons succeeds in capturing the visual grandeur of 16th-Century England, but its the script (also penned by Bolt) that really stands out. In one scene, Sir Thomas, who's locked away in the Tower for refusing to take the Oath of Loyalty, is visited by his family. His daughter, Margaret (Susannah York) had, up to that point, supported her father’s position, yet now begs him to reconsider. His wife, Alice (Wendy Hiller), also pleads with Sir Thomas to concede the point of the marriage and return home. Scofield handles it all brilliantly, evoking the anguish the real Thomas More would have undoubtedly felt in this same situation. The joy of seeing his loved ones for the first time in years is all but shattered when, one by one, they ask him to do what he simply cannot. Thomas More’s family had been his strength throughout this entire ordeal, and now they've turned on him as well. As you can imagine, the sequence is incredibly moving. As portrayed in A Man For All Seasons, Sir Thomas More was a firm believer in honoring ones values, whatever the cost. I was impressed with his stance, his almost stubborn adherence to what he believed was right, and I did come to respect the man. It's because of him that I hold A Man for All Seasons in such high regard. Its lessons of faith and determination are timeless.